I am fortunate enough to have my own sandtray for therapeutic work with clients. I used it with a client last week which has prompted me to share some of my thoughts on the process. The article above gives some background information on sandtray work. I personally find it is useful for working in areas of "stuckness" with a client, i.e. where the client has reached an impasse on an unresolved and painful issue, often from childhood, e.g. abuse or trauma but could be from later on in life e.g. a painful divorce, death or other trauma. 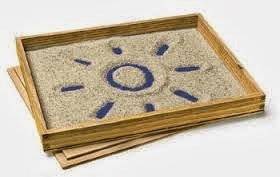 Last week I suggested sandtray work to a client as they were finding it hard to find the words to describe their pain and had some stuckness with a particularly painful childhood issue. This was a perfect scenario for sandtray work as words are not required for expression in this field of therapy as it taps into the unconscious. It was agreed well in advance when the sandplay session would be - it is important for the client to make space around the session as it can be powerful and evocative. The trays are a very specific size and shape based on the field of vision. Along with the tray itself is an extensive collection of miniatures of all kinds of shapes and sizes from toy animals, pieces of fabric, jewellery and many other items of bric-a-brac. This really is the client's realm as they select what they are drawn to and are invited to use them with the sand in any way which feels intuitively right for them. This process can take some time and the client may place some objects with no thought required whatsoever then struggle with other items that they feel compelled to include but need time to do justice to the placement of these items. Eventually, the client will indicate that they are satisfied with the arrangement. This is a good time to invite the client to share their thoughts on what they have done. It is important not to intrude into their realm, but to tentatively ask questions regarding particular items (no closed questions!) and to notice e.g. "I noticed that you were very decisive with that piece and the piece next to it seems to have been more difficult for you to place. Asking questions to clarify helps the client make sense of the world they have created. A box of tissue needs to be on standby of course. Whenever I have engaged in this therapy myself I have found it very powerful emotionally and tears are often a natural part of the process. One thing I have noticed is that time absolutely flies by with this kind of work, so gentle reminders of the time are required and general time management important so as not to rush the client or finish abruptly. It is considered essential for the client to be given the choice to dismantle their own masterpiece - a piece of art in the true sense of being an outward expression of what is going on inside. I always ask if they would like a picture - it could be useful for their personal development or for use in future sessions. The client takes the objects out themselves, although should they prefer, they can leave it for me to do, and swish away any patterns they may have made in the sand. During my training there were many cynics among the class who really did not see how playing with sand could be powerful therapy. By the end of an afternoon experimenting on each other most were converts. I'd only used objects/stones etc before, I didn't know there was a specific 'sandtray method'. Thank you very much for your comments. Using objects/stones is very similar and I sometimes use those, especially if I don't have access to a sandtray. The addition of sand, however, increases the possibilities of exploration as items can be buried and perhaps later on exposed, or have walls built around them, for example.